Dead `ohi`a with live trees and uluhe. Lots of news organizations spread word that a variant of the Rapid `Ōhi`a Death fungus has been found on Kaua`i, but none told the larger story. That story is the powerful effort that’s going on to save the tree that has been called the mother of the forest. `Ōhi`a is really a remarkable part of the Hawaiian environment, growing in many environments from sea level to high mountains, and in many cases serving as the dominant canopy tree. It feeds and houses insects. Those insects and the tree’s nectar feed birds. And it houses birds, both in its branches and in cavities in its trunk. It is prominent in culture, common in legend, and it’s just plain gorgeous with its crimson and orange puffball flowers and widely varying leaf types. Buds can be reddish or orange or green, and shiny or covered with a frost of silver hairs. “It is the foundation tree of our watershed,” said Bob Masuda, deputy director of the state Department of Land and Natural Resources. As a community we despaired when there arrived a fungus, Ceratocystis lukuohia, which began killing trees by the thousands on Hawai`i Island. Many trees were infected and once infected, death was certain often in days to weeks. It was sometimes called `Ōhi`a Wilt, and sometimes more dramatically, Rapid `Ōhi`a Death. It turns out that a small percentage of trees was also infected with a slower-developing related fungus, Ceratocystis huliohia. It could take months to years to kill a tree, often taking single branch systems before killing off the entire tree. 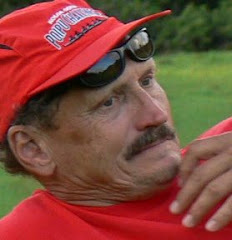 Here's a piece on how they got their Hawaiian names. That’s the one that has now been found on East Kaua`i. Not nearly as virulent as its spooky cousin, but still a problem for `ōhi`a. Foresters suggest it probably shouldn’t be called Rapid `Ōhi`a Death, because, well, it doesn’t progress so rapidly. There are some interesting things about these diseases, including that they appear to have very different sources. The fast-acting one is most closely related to fungi in Latin America, while the slower one appears to be more closely related to Asian fungi. 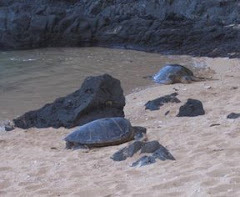 And the slower-moving version may spread slowly enough that it was in the Hawaiian Islands first, but wasn’t recognized. 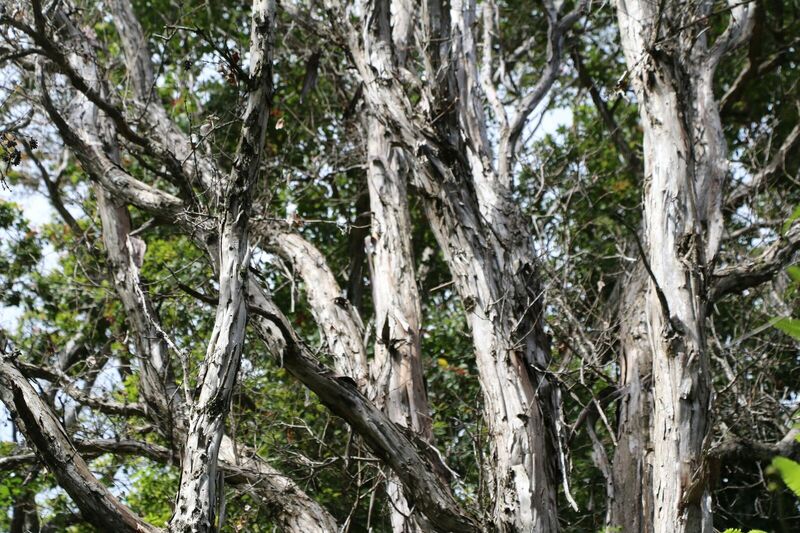 There are lots of things that can kill `ōhi`a trees, lots of disease that can attack them—although none as aggressive as Ceratocystis lukuohia. One of the big unanswered questions about both diseases is whether there is hope. Whether there are any examples of `ōhi`a trees that may be resistant—and thus could be used to repopulate the Hawaiian forest. To help find that out, lots of research is underway, including aerial surveys on several islands to better understand the outbreak. Here’s one study on the aerial monitoring from the journal Remote Sensing. Pathologist Lisa Keith, of the USDA Pacific Basin Agricultural Research Service, said that researchers are growing seedlings of different varieties of `ōhi`a and infecting them with the fungus. So far, some are still surviving—perhaps a good sign, although they may just be heading downhill slower than others. She and others are also working with different fungicides, which may not save an infected tree, but might keep a particularly valued tree alive longer. Others are working with other techniques to try to strengthen the trees so they can potentially survive infection. It’s clear that humans are big carriers. If a tool like an ax, chain saw or machete cuts an infected tree, it can easily spread the disease if you cut into a second tree without disinfecting the tool. Any injury to the tree can be a highway for infection. Scientists are studying the beetles that may be spreading the disease by boring into the trees. And they’re trying to determine how effective the fungus is at being spread by wind. And what if it’s not just those beetles, but other insects. Researchers have chunks of infected tree wood in netted containers, to watch what other insects might emerge over time. If the disease is spread by wind, then perhaps you could limit the spread by cutting down a swath of trees downwind from an infected patch, to deny the fungus trees to spread to. Kind of like cutting a firebreak. The state Division of Forestry and Wildlife is working on that technique. Researchers are studying old photographs of the forest to try to determine what they can about disease in `ōhi`a over the years. And scientists have developed quarantine measures to reduce the spread—like limiting the movement of infected wood. The number of organizations working on this issue is impressive. 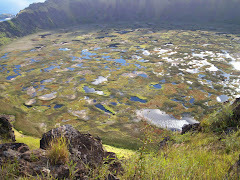 It includes the University of Hawaiʻi at Mānoa College of Tropical Agriculture and Human Resources, the U.S. Pacific Basin Agricultural Research Center, USDA Forest Service Institute of Pacific Islands Forestry, the Department of Land and Natural Resources’ Division of Forestry and Wildlife, University of Hawaiʻi at Hilo, The Nature Conservancy, National Tropical Botanical Garden, Hawaiʻi Association of Watershed Partnerships, Coordinating Group on Alien Pest Species, the Big Island, Maui, Molokai, O'ahu and Kaua'i Invasive Species Committees, USFS Region 5 State and Private Forestry, USGS Pacific Island Ecosystems Research Center, Carnegie Airborne Observatory, Hawai'i Invasive Species Council and Hawai`i Department of Agriculture -Plant Quarantine Branch. Learn more about the disease here. A sign of hope is that not every tree in a diseased stand dies. But it’s not yet clear whether that’s because surviving trees might be resistant to the disease, or that they simply haven’t been infected yet. That said, the `ōhi`a is so important to the Hawaiian environment that researchers and foresters hope to be able to identify resistant trees. 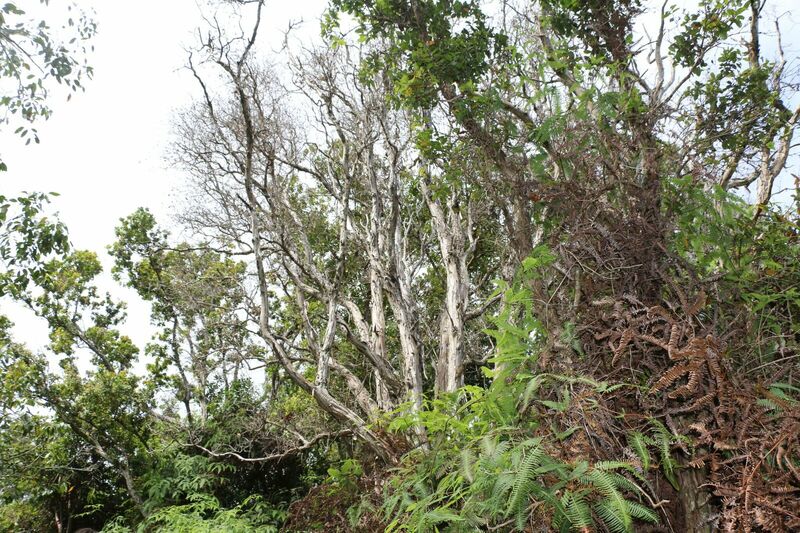 If they can find them, then the daunting task will be a massive statewide effort to replant these seminal trees throughout the Hawaiian forest. Excellent post. Mahalo! Hoping for a remedy.